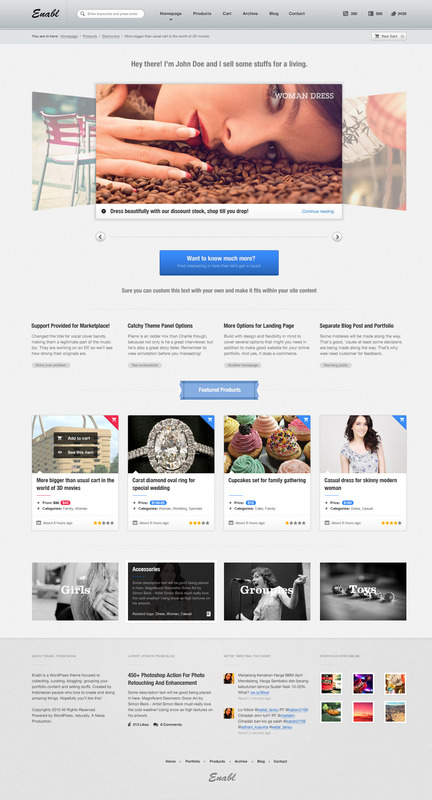 Now Commerce is compatible latest Woocommerce 2. Thank you for your support, we do really appreciate it! Yes, Commerce WordPress theme is Premium WordPress ecommerce theme with pinterest style that’d be perfect and suitable for your retail and online business store. You can sell wide-range categories, almost any type of your products for your online store. 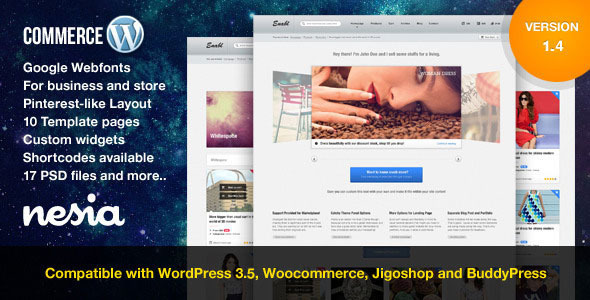 Of course this theme will makes your store looks more outstanding and modern than standard online store out there. Built-in custom widgets — Custom widgets available for you to place on your sidebar or footer area. Just select your widget then drag ‘em to widget areas, show ‘em to your visitors. Check out the demo page to view it. Responsive with your mobile devices — Did we mention it earlier? Yes, it does responsive layout for your mobile devices. For viewport 1200+ (desktop computer), 1024+ (notebook and iPad landscape mode), 768+ (netbook and iPad portrait mode) and viewport under 640px (Smartphone). Of course, swipe support for all carousels on your devices. Pinterest Layout — See this layout in action on homepage to show all your products or all items you have including blog post and check out the product page. 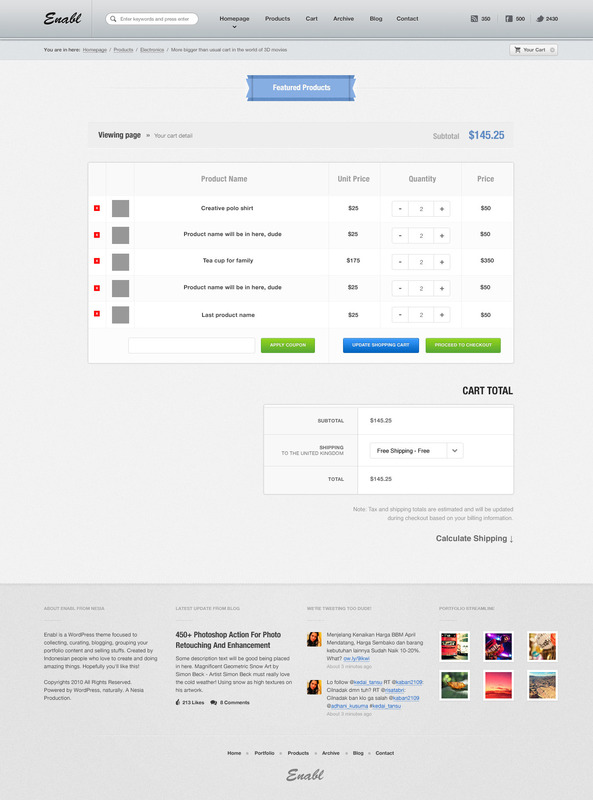 We’re too kind to let you have this layout for your nices store. Enjoy! Five options for homepage layout and two type slider — Available with 3D slider or fullwidth carouslider. Choose it with your prefer slider to display. This homepage layout options really useful for A/B testing your homepage, which one that attract more visitor while visiting your online business store. Just select and assign your page template. Tumblog format blogging — Yes, it does support with video format (oembed) and audio using jPlayer. Also, it does responsive. Wohoo! Attention. PSDs files inside this bundle, the rest of PSDs files you can request manually through contact form on our profile page. Be happy! Sorry for this, due to error while uploading, we decide to split these files. Please make your request. 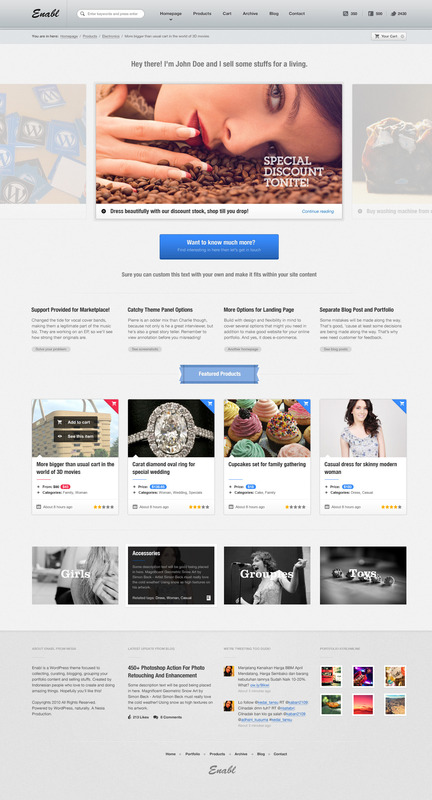 Pinterest layout for homepage and products page. All slider and carousel displayed with responsive layout for mobile devices. Five homepage layout, useful for A/B testing. 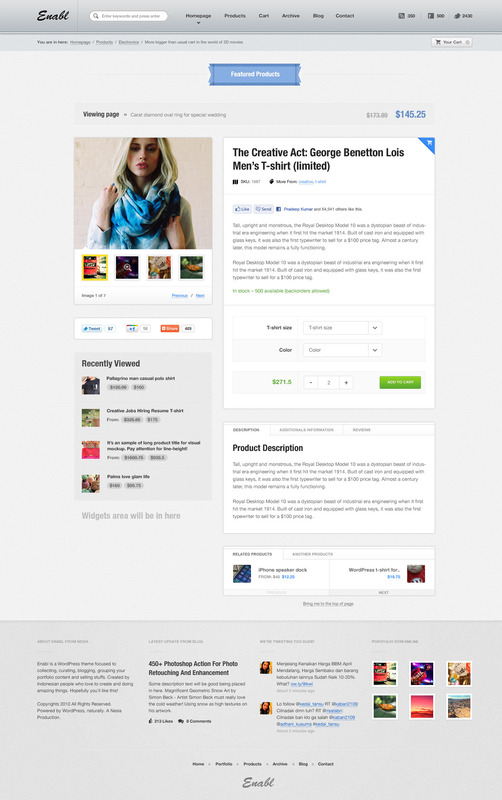 Two layout options for products page, pinterest layout or standard non-dynamic image height format. Two pagination options, with load more (infinite scroll) trigger or standard pagination through number of page. PSDs format for customisation. All layers are separated and well organizing. Please make a request for the rest of files. Yes, we build this template on top (very) rock-solid framework and that’s all already inside this Commerce WordPress theme bundle, just for you! * Fix: Hide full window slider before all images are loaded to prevent layout "jumping"
* Edit: WooCommerce - Button for external product. * Fix: Sorting on shop masonry page. * Fix: Theme options on breadcrumb. * Fix: Pagination on search page. * Fix: Support for WooCommerce 1.6.+. * Edit: Counting follower twitter and fan pages likes with js script. * Edit: Change button if out of stock. * Edit: Now can display subcategory products on home page. * Add: Field setting at theme panel, for manage ribbon. * Add: Field setting at theme panel, for manage filter product on homepage/template page (recent, featured, sale, and popular). * Add: Field setting at theme panel, for enable auto rotate and auto rotate interval for 3D Slider. * Edit: Social icon on Subscribe widget. * Fix: jigoshop - images gallery on single product. * Fix: validation on Template Contact page. * Add: template Home - Post like Pinterest. * Add: widget - latest post. * Add: Field setting at theme panel, for manage products featured at home page. * Add: Field setting at theme panel, you can check/uncheck for force height at single product gallery. * Fix: Logo on footer, now can manage on theme options. * Fix: Title section on taxonomy page. * Fix: Bugs on rating product at shop page (WooCommerce). * Edit: Change get count fans and follower methods.